The color blue has often been associated with the most iconoclastic work of the 20th century’s cultural contributors. “Rhapsody in Blue” established George Gershwin’s reputation as one of America’s seminal composers. “Blue Train”, John Coltrane’s 32-bar form masterpiece and also the name of his second solo album, is one of the most legendary examples of the hard-bop style of jazz. Miles Davis’ iconic Kind of Blue is popularly considered to not only be the greatest jazz masterpiece ever, but also the single best-selling jazz album ever produced. Blue, Canadian singer-songwriter Joni Mitchell’s extrapolation on relationships, was selected by The New York Times as one of the 25 albums that represents “turning points and pinnacles in 20th-century popular music”. Picasso’s introspective, somber paintings from his Blue period between 1901 and 1904, just before his Rose period and his subsequent launch into Cubism, represent some of his most poignant and personal figurative work. Leading contemporary artist and judo master Yves Klein’s “Proposition Monochrome; Blue Epoch” featured 11 identical blue canvases made from ultramarine pigment suspended in resin. Betty Blue, which received both a BAFTA and an Oscar nomination for Best Picture, directed by Jean-Jacques Beineix and starring Béatrice Dalle was one of the late 20th century’s most emotionally haunting films, while Blue Velvet remains to this day David Lynch’s most powerful exploration of sinister themes in suburban America. The color blue encapsulates both sadness, as in the eponymous Krzysztof Kieslowski film, and optimism, as expressed by Dickey Betts’ stirring paean “Blue Sky”. It is capable of — to co-opt the words of Charles Dickens — expressing the best of times and the worst of times, the epoch of belief and the epoch of incredulity. If, as Proust said, style is “a revelation of the particular universe that each of us sees and that others do not”, what does wearing a blue-dialed watch say about you? We like to think it expresses a certain level of complexity, a somberness and yet a capacity for boundless hope. If your inner emotional condition relates to the color blue and you want to make it manifest, we can think of no better way than with Jaeger-LeCoultre’s Grande Reverso Blue Enamel. 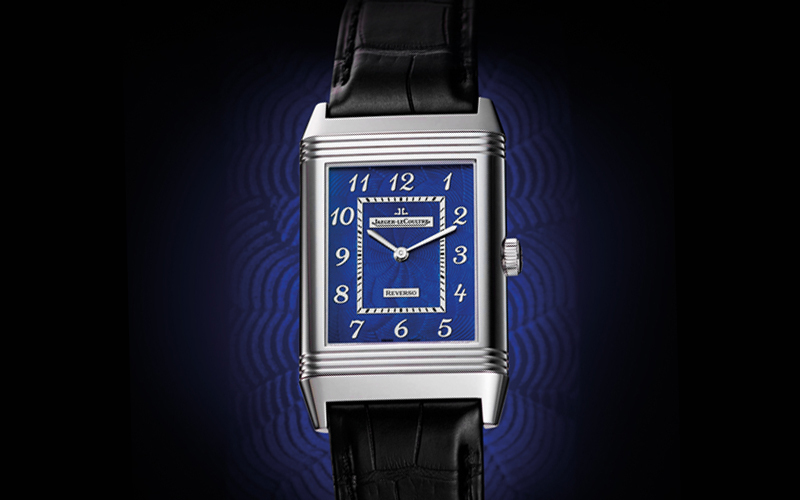 In design, the watch harks back to the Arabic index iconography of 1930s Reverso watches. On that subject of retrospection, this year, Jaeger-LeCoultre also scored a big hit with the Grande Reverso 1931 Rouge, which features a red-colored dial popularized by the French avant-gardists in the 1930s. As much as we like the new Grande Reverso 1931 Rouge with its brilliant red dial, it is worth pointing out that the color red in that timepiece is achieved using lacquer, while the dial of the Blue Enamel is created using one of the most mythological artisan crafts of all time. “Flinque” is a term for a gold dial that has been first decorated using guilloché and then covered with several layers of translucent enamel. In this instance, the white-gold dial of the Blue Enamel receives multiple layers of enamel paint and 20 firings in a kiln at 800°C. This process is one of the most nerve-wracking in horology, as at any one of these firings the dial can crack and the whole process has to be redone from scratch. The benefit to these multiple layers, including the final translucent layer, is to create a transcendent pool of sheer color so intense that it seems organically alive. In addition, because enamel will never lose even a fraction of its famous intensity, the vibrancy of the dial will remain a living reminder for generations to come of your flawless aesthetic discretion, unless of course you decide to be buried with the watch. Crowning the fathomless sea of blue are white-gold Arabic numerals as well as a white-gold minute track and delicate white-gold plates for the brand and model signatures. The white-gold case is large at 48.5mm by 30mm, but tastefully slender at just 10.24mm thick, including both the swivel case as well as the carrier. The flipside of the watch features a solid caseback to allow the possibility for personalization, though our ideal flourish would be an engraved monogram filled with enamel of the same color: electric blue.